This article originally appeared in the April 23, 2018 issue of SpaceNews magazine. For years, the U.S. space and satellite industry benefited from the strength of the military and broadcast sectors. When space companies needed to hire more engineers, they could use defense-backed research and development contracts to create positions, or they could lure professionals away from the television industry and apply their skills to satellite transmissions. That’s not currently the case. Broadcast companies are keeping headcounts low as Netflix and other over-the-top internet streaming becomes more widespread. And the defense sector, with a renewed focus on reducing costs, is not the skilled-workforce catalyst it once was. Today, tech talent is being lured away from the space industry. Web giants like Google, Facebook and Amazon are snapping up engineering graduates wooed by high-paying jobs and a sprawling work campus rife with amenities. The result is a “graying” aerospace industry — one that is losing people to retirement faster than it can backfill jobs with fresh talent. Comparatively, the median age across all engineering fields in the U.S. is between the late 30s and early 40s, according to Deloitte. Put simply, there is a sizeable gap. The space industry recognizes it has an awareness issue. When people think space, they often think NASA, and little else. True, billionaire-led companies like SpaceX, Blue Origin and Virgin Galactic have opened many eyes to the broader space industry, but that hasn’t generated enough hiring leads to match industry needs. Robert Bell, executive director of Space & Satellite Professionals International, a trade group that in 2016 conducted a study on industry hiring and workforce patterns, said the industry can do more to change its public perception. Study discussions with human resources professionals found that only 25 to 30 percent of space companies had robust plans to foster young talent, such as internship programs or university outreach, he said. “All the human resources directors we talked to said basically we have this problem: we have a workforce that’s older than we would like it to be. We have young kids of course, but we have a lot of these 45- to 55-year-olds — the biggest group in the industry — and we are all fishing in the same pool for the same people and there’s not enough of them,” he said. In his own discussions with science, technology, engineering and math (STEM) students, Bell said he often finds them ready to pursue limited and coveted positions at NASA, but unaware of a massive commercial industry that exists and is in need of new hires. Small businesses tend to be the least active in recruiting younger talent, Bell said, adding that space companies regardless of size need to be more active on university campuses. Ed Swallow, the senior vice president of The Aerospace Corporation’s Civil Systems Group and former chair of the National Defense Industrial Association’s STEM Workforce Division, said companies need to start earlier than college or high school. 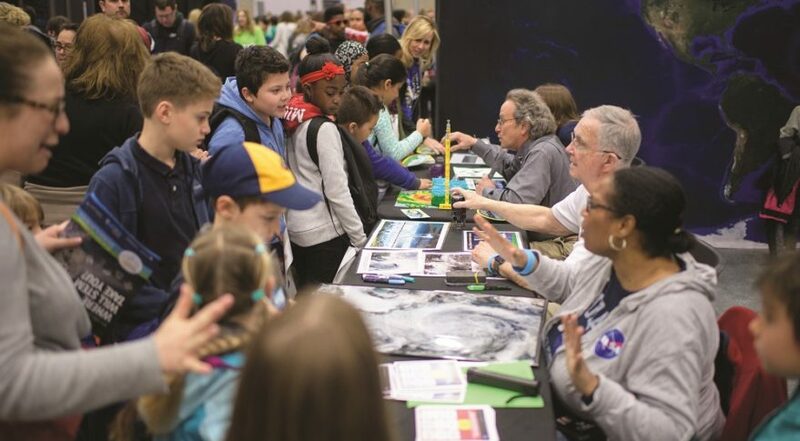 Space companies that get involved in early academic years won’t see an immediate payoff, but through industry organizations, they can make a collective difference, he said. Swallow said space companies should also compete with tech firms in other industries by emphasizing purpose in work. “Something pretty well accepted about the millennial generation is they want a job where they make a difference. They want a job where they are going someplace, not necessarily being promoted every year, but going somewhere with their career… Lord knows our industry makes a difference every day. I don’t know how much time companies spend talking about the difference they make,” he said. Swallow said proactive industry engagement at younger academic levels is also a necessary step to foster greater diversity in the space industry. According to Aviation Week’s 2016 workforce report, the percentage of women in the aerospace and defense sector stood at 21.9 percent, and hasn’t budged much in three decades. Asian, African American and Hispanic members of the workforce each counted for roughly seven percent. 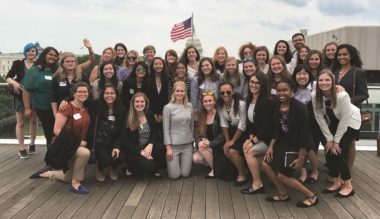 Lori Garver, NASA’s deputy administrator from 2009 to 2013, said it would be some time before women join the space industry in numbers strong enough to help offset the dearth of new employees, but having women both as peers and role models will encourage more to join the sector. Garver co-founded the Brooke Owens Fellowship to create more opportunities for young women to enter the space industry. What began as a mission to mentor a handful of women in honor of Dawn Brooke Owens, a pilot and space industry leader who passed away in 2016, quickly grew to a class of 36 in its first year. In 2017, the Brooke Owens Fellowship had nearly 200 applicants, resulting in 41 “Brookies” interning with space companies during their junior or senior years of college. Deloitte’s Matthews said a disconnect persists in getting women from STEM backgrounds into the space sector, but that solving it will benefit the industry’s workforce challenges. Garver, hoping to bridge that disconnect, said she expects the Brooke Owens Fellowship will only continue to grow in numbers.